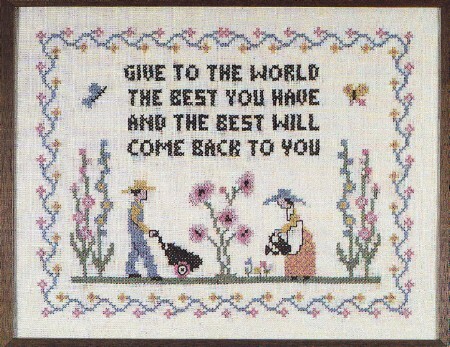 This cross stitch stamped sampler expresses the best of both worlds,love,a happy couple enjoying nature and producing beauty to the world.Gardening is a social pleasure and this printed cross stitch sampler lets everyone know why you are happy.Do not forget the main theme,Christian Charity. My favorite...I like your product a lot but I also like samplers with a message or quote/saying. Hard to find these days. It's a wonderful piece to work on as it gives you a sense of peace, as you do! I agree with the other review, there's not much for needlework out there, that have such meaningful words on it. The Mr & Mrs in it seem very content to be growing and giving back. When it comes to kindness, pay it forward. The world would be a better place!